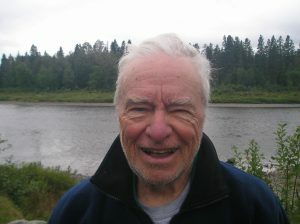 Craig R. Gralley’s father, during their trip to the Allagash River. Last summer my family had a true adventure. For seven days in September, we paddled some 90 miles down the Allagash Wilderness River in northern Maine. The Allagash is not one river, but a series of rivers and lakes that winds its way through some of the most remote forests our country has to offer. We met our back woods guide, Wes and he drove us deep into the woods–across miles of unpaved logging roads, making turns where there were no signs. Five hours later we reached the put-in point: a non-nondescript spot of gravel at the end of the road bracketed by two large hemlocks. There were four of us in two canoes–my brother, my wife, me and our father, who was about to tum 85. Wes paddled ahead in his own canoe to show us the best approach down the river and warn us of rocks and white water. Our routine was to eat breakfast and break camp at 6 a.m., paddle for eight hours, pull into camp, set up the tents, eat dinner and go to bed. That was the itinerary for the week. Early on, I was concerned my 84-year-old father might not be fully prepared for this challenge. He grew up on Maryland’s Severn River, where he built and sailed boats as a hobby. He also was in great shape but his preparation for this wilderness trip was another question. He’s frugal. He brought a drawstring trash bag as his waterproof tote. There were surprises. After our canoe tipped in whitewater, my legs were speckled with small black leeches. My wife found a rodent in her sleeping bag one evening and a coiled snake in a dark outhouse the next. While the trip was filled with minor adversities, we did not see the sun for seven days. Each day we faced a cold, penetrating, and relentless curtain of water. At no time during this trip were we completely dry. Our adventure down the Allagash was memorable. We survived minor adversities, but more remarkably, not one harsh word was uttered between us. Instead, we sought opportunities to discover the humor in our often grim circumstances. My Dad was not one to preach, but let life teach us as it unfolded. When one family member was facing a serious illness, he said, “You can’t control your circumstances—life is too big for that—but you can control your response to it.” Your attitude in response to adversity can help you not only to endure but make the most of the opportunity you are handed. Sure, we had setbacks—the cold rain, the leeches, the snakes and all of the other inconveniences. But as life on the river unfolded we decided we still were going to have a good time regardless of our surroundings. Then the opportunities for fun, good humor, and camaraderie—in short, an of the things that make a truly great family vacation began to emerge. Having the right attitude, regardless of the battle being waged, be it within the confines of a hospital room or the great outdoors is a lesson worth keeping.